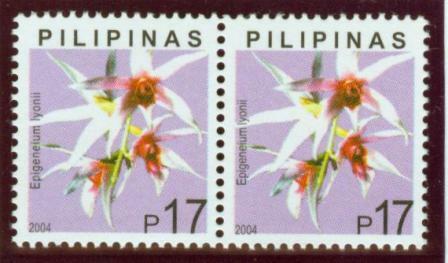 The 2003-2004 Native Orchids definitive series includes 12 issues with 33 stamps. 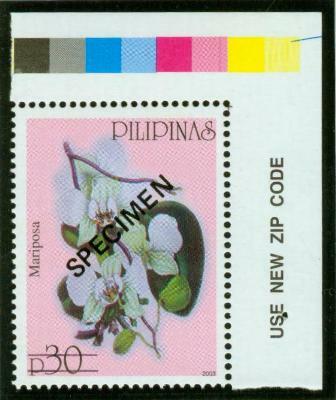 However, there are 23 more varieties (+ 4 with “SPECIMEN” overprints) for specialists to pursue. 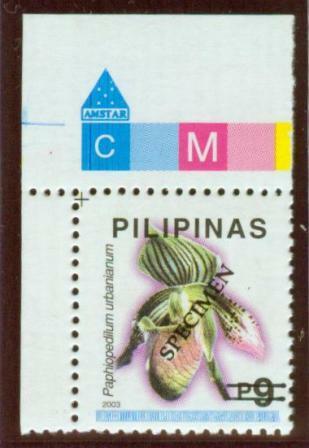 All the lower value stamps (1p to 22p) were printed by offset-litho by APO Production Unit, Inc., except for two 9p values which were printed by Amstar. 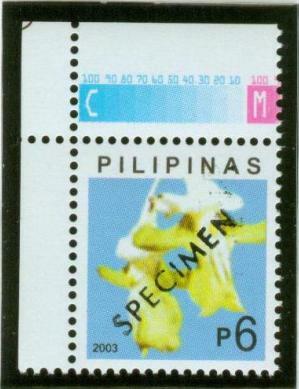 APO used to be part of APO-NEDA (Asian Productiv­ity Organization Production Unit - National Economic and Development Authority), a quasi-government company which printed postage stamps for the Post Office between 1975 and 1989. 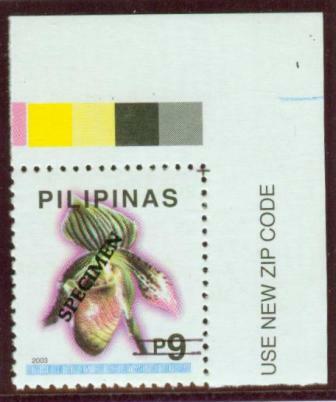 All the stamps printed by APO for this series were in sheets of 100 (10x10), by offset litho, and were perforated 14 ¼ º. The two 9p definitives printed by Amstar were by offset-litho, also, but were in sheets of 200 (20 x 10) and perforated 13 ½ º. The four high values (30p to 100p) were all printed by Amstar by offset-litho, too, and in sheets of 50 (10x5), perforated 14 º.
APO used a new type of phosphorescent security mark on these definitives. It is in greenish-yellow, similar to what Amstar used before they changed it to reddish-orange in 1998. 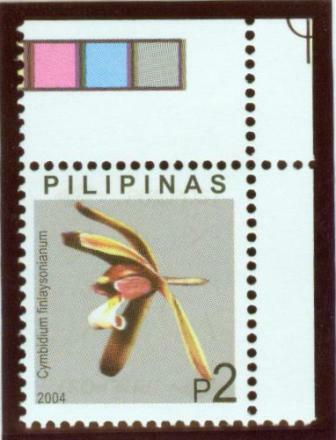 Each stamp has two of these security marks, which consist of the Philpost logo and "PHILPOST" to the right of the logo, each measuring 17 mm. x 2 mm. One is near the top, usually overlapping the lower half of "PILIPINAS", and the other is near the bottom frame line, but inverted. Paper C - which is glossy on the front, but not as white as paper A. This has "invisible" matt (dry) gum. After soaking and drying, this paper will show very shiny backs! Under ultraviolet light, this paper is fluorescent on both front and back, and is actually a bit brighter than Paper A. Most of the small-sized definitives have renegotiated quantities, that is, there are additional quantities over and above the ordered quantities, which were taken from the (usually) 10% over-runs allowed to ensure that the ordered quantities can be delivered after taking out spoilages. Since APO did not segregate the original printings from any new printings when they delivered the renegotiated quantities on December 14, 2004 (for the 6p, 10p, I7p, 21p and 22p) and on November 10, 2005 (for the lp, 2p, 5p and 8p), the quantities given for stamps with renegotiated quantities are estimates only, which were arrived at by pro-rating the renegotiated quantities to the respective ordered quantities. Amstar used the same security paper it imports from Spain since 1994 to print the two 9p and the four high values. The paper is non-reactive to ultraviolet light and has some phosphorescent fibers embedded on both front and back when viewed under ultraviolet light. 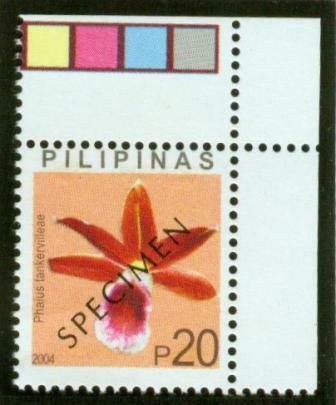 The phosphorescent security marks, in reddish-orange, are printed all over the stamps in the sheet. They consist of "PHILPOST" with its logo above it and a line identical to the blue security band printed on all Amstar definitives below it. These are arranged close together in lines, in four orientations: upright, inverted, sideways and sideways in­verted. The ones printed sideways and sideways inverted do not have the line below PHILPOST. Note: APO delivered their renegotiation packages for all of the series without segregating the original from the revised printings. Guesstimates were made by using the quantities ordered for each and then prorating the negotiated quantities. Thus +/- (plus and minus) signs are indicated where deemed appropriate. The actual order to APO was 16,000,000 for the 6p and 1,000,000 each for the 17p and 21p. The excess quantities are estimates from the combined renegotiation package APO delivered on December 14, 2004, which included the redrawn versions (2,120,000 for the 6p; 300,000 for the 17p and 380,000 for the 21p). For the 9p, Amstar delivered the renegotiated quantities for both this original printing and the redrawn version together on December 16, 2004. The two were in separate packages, though. The actual order for this stamp was 2,000,000 pieces only. 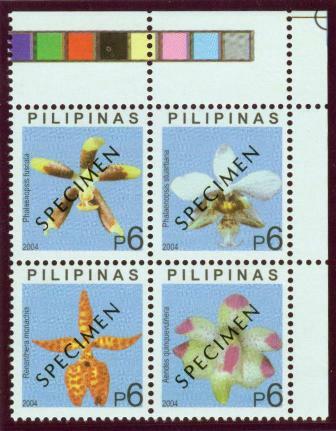 500 of each of these four stamps come with "SPECIMEN' overprints. The ones from APO are handstamped with a metal device (instead of machine-printed), so the position of "SPECIMEN” varies. The backside of the stamps will show clearly the indentations from the pressure used to handstamp these stamps, especially on the letters "S" and "N" areas. The 9p from Amstar has the "SPECIMEN” machine-printed with the denomination crossed-out by two hand-drawn lines. 1,500 first day covers, equally distributed between two different cachets, both printed by APO, were produced for this series. Amstar did not print any first day cover envelopes until the redrawn versions were issued. 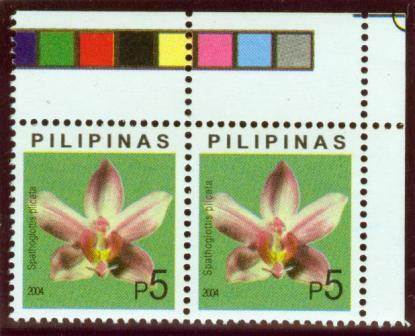 As with the originals, only estimates can be given for the total quantities for each of these four stamps. The actual order was for 3,750,000 of each value. 1,750,000 of the 17p and 1,500,000 of the 21p are on the original Paper A; 2,000,000 of the 17p and 2,250,000 of the 21p are on the newer Paper B. 500 of each of these two stamps, both on Paper B, come with "SPECIMEN" overprints. This time, they were machine-printed. The remaining first day cover envelopes for Series I were used to service Series II, with an additional printing of 100 each of the two cachets. 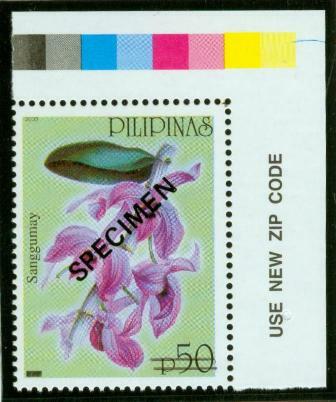 500 sets come with machine-printed "SPECIMEN" overprints, and all have the denomination crossed out by two hand-drawn lines. 750 pieces of first day cover envelopes were printed to service this issue. 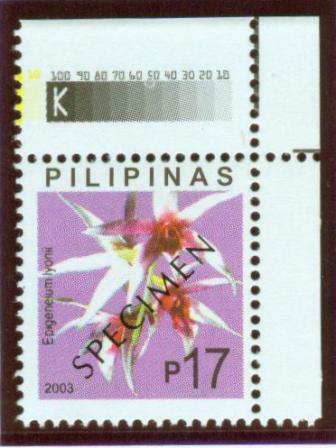 These two stamps were actually approved for printing in 2002, and Amstar had prepared the plates already then. Suddenly, their issuance was postponed, and so the plates had to be shelved. When finally the go signal was given and Amstar got the order to print, they forgot that the stamps carry the “2002” year dates. It was only after all the stamps had been printed that they noticed the wrong year dates! 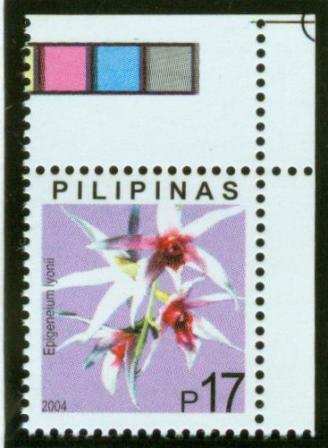 In order to avoid wastage and more printing costs, Philpost agreed to Amstar's proposal to just overprint all the printed stamps. 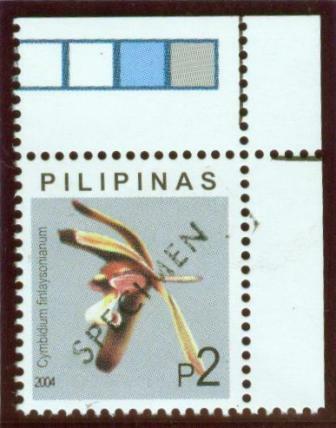 A small black bar to cover “2002” and a tiny “2003” to be printed on the upper right corner of both stamps were all that were necessary to correct the problem. So all these two stamps exist with the black bar and so far, none without the black bar has been reported. 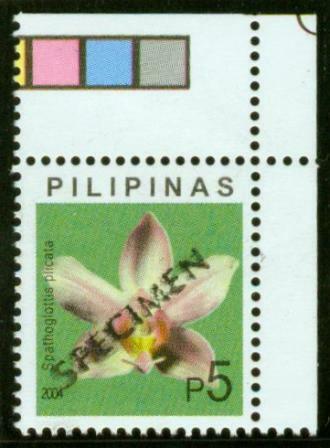 500 sets come with machine-printed "SPECIMEN" overprints, and the denominations are crossed out by two hand-drawn lines. 500 more first day cover envelopes were ordered for this issue, but due to a misunderstanding, the same cachet design on the Series III envelope was used again! 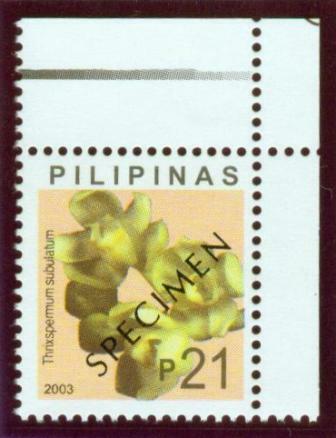 Type I - has the orchid's Latin name 13 mm. long. 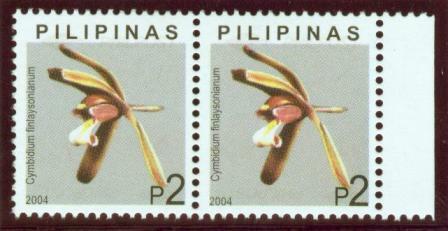 Type II - has the orchid's Latin name 14 mm. long. On this variety, the name starts closer to "2003" and ends with "is" inside the green leaf on the upper left instead of just touching the lower edge of the leaf. It occurs 12 times on each sheet of 100: on position #s 35, 40, 61, 62, 63, 64, 65, 66, 67, 68, 69 and 70). The actual order was: 48,000,000 for the 6p; 3,000,000 for the 10p; and, 3,750,000 for the 22p. The excess quantities were from renegotiations. 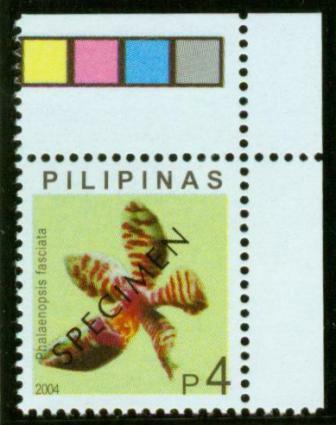 500 sets of each of these three stamps come with "SPECIMEN” overprints. They are all machine-printed. 500 first day cover envelopes with a new cachet were printed for this issue. The actual order for 9p was for 2,000,000 pieces only. The excess was from renegotiation delivered on December 16, 2004. 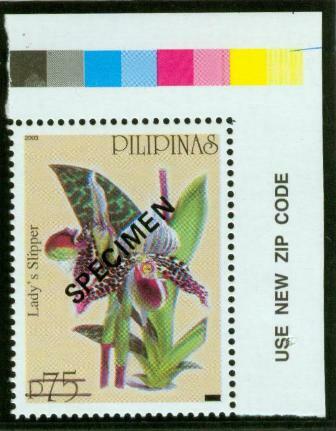 500 pieces come with machine-printed "SPECIMEN” overprints, and the denominations were deleted by two hand-drawn lines. 500 first day cover envelopes were printed by Amstar for this issue. The "2004" year dates have all the four digits joined together, and they do not touch the left and bottom frame lines. 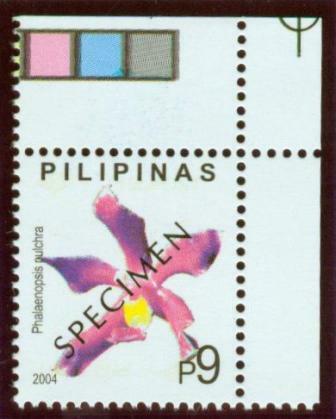 The denominations on both stamps are also set far from the right and bottom frame lines. 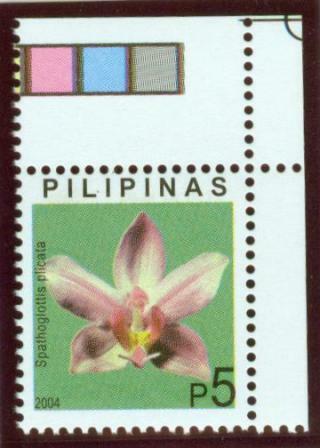 Type I - has a 1/2 mm space between the orchid's Latin name and the orchid. Type II - has the name shifted to the right, so it touches the orchid. This variety occurs only three times on every sheet of 100: position #s 82, 85 and 87. On every sheet of 100, position #s 14 and 19 have the space between the name of the orchid and "2004" 4 1/3 mm wide instead of only 3 2/3 mm. 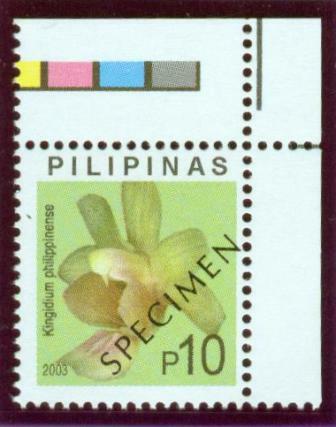 Type I - has the orchid's Latin name 10 1/2 mm. long. 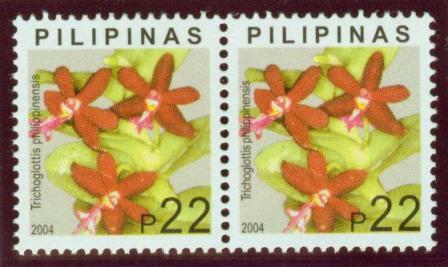 Type II - has the orchid's Latin name 12 mm. long. On this variety, the name actually starts closer to 2004, but the letters are farther apart, so it ends closer to the top frame line, with only a 3 mm. space between them instead of 4 mm. This occurs eight times in every sheet of 100: on position #s 10, 40, 50, 60, 70, 80, 90 and 100. The actual order was for 500,000 of the 1p and 2,500,000 of the 5p only. The excesses were estimated from the combined renegotiation package APO delivered on November 10, 2005, which included the redrawn versions. 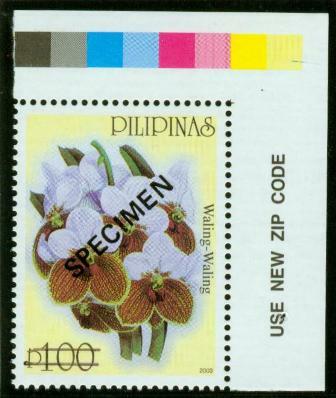 500 sets of these two stamps come with "SPECIMEN” overprints, which were handstamped with a metal device, not machine-printed. 2,000 first day cover envelopes with two different designs (so 1,000 each) were ordered to be used by the four sets of two values each that were planned for 2004 (500 envelopes for each set). However, since the planned third and fourth sets were issued together on June 11, the quantities of first day cover envelopes for each of the three sets had to be increased. Around 650 envelopes were allocated for Series VII. The 2p has the "2004" year date in the old style, with all four digits close together, and does not touch the left and bottom frame lines. The denomination is also set far from the right and bottom frame lines. The 8p has the "2004" year date and denomination in the new revised style, with the "2004" having spaces between the four digits, and it touches the left and bottom frame lines. The denomination also touches the right and bottom frame lines. 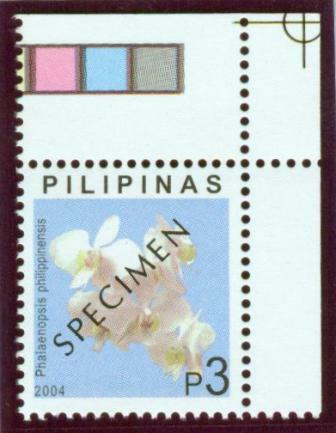 Type I - has the orchid's Latin name 13 1/2 mm. long. Type II - has the orchid's Latin name 14 3/4 mm. long. 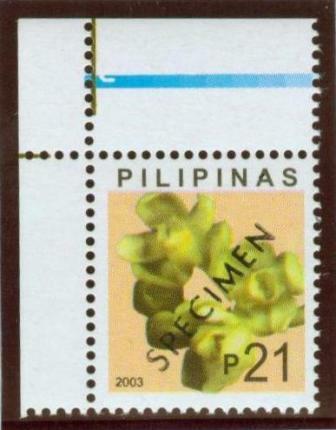 On this variety, the name starts closer to "2004", but the spacing varies on some stamps. The name ends with the "m" over the top tip of the second petal at top left instead of almost in line with it. This type occurs 20 times in every sheet of 100: on position #s 1, 6, 11, 16, 21, 26, 31, 36, 41, 46, 51, 56, 61, 66, 71,76, 81, 86, 91 and 96. The actual order was for 3,000,000 pieces of the 2p and 250,000 pieces of the 8p only. The excesses were estimated from the combined renegotiation package APO delivered on November 10, 2005, which in­cluded the revised/redrawn versions. Two new varieties, both involving the year date “2004” were discovered by Mr. William Tharp of Canada. He reported the 8p variety first, in April 2010, and soon after, found the 2p variety too. APO had somehow used the joined “2004” year date that are found on the original printings of the 1p and 5p on two positions on each of these sheets! On the 2p, the new variety, which I will now call Type III, has the four digits of “2004” all bunched together, almost overlapping, aside from having the longer name. It occurs only on position #s 1 and 6. 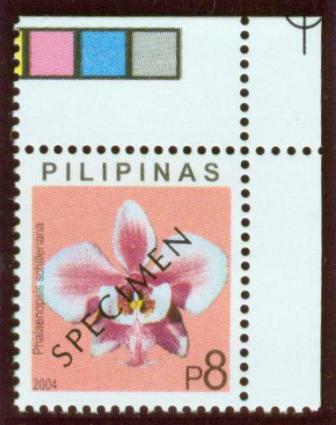 All the other 98 stamps on the sheet have the “2004” quite close, with just a little gap in between the “2” and first “0” and between the first and second “0”s, but with the “4” touching the second “0”. On the 8p, the Type II variety has the four digits of “2004” touching one another, without any space between them. It occurs only on position #s 41 and 42 on each sheet of 100. All the other 98 stamps (Type I) on the sheet have a space in between every two digits, though some may seem to be a little bit closer than others. The two copies Mr. Tharp found are both on the newer paper with invisible, dry (matt) gum (in Series IX), but since the later printing used the very same plates as for this issue, the varieties are found here also (and a few copies were located already). Considering the very low mintage, this variety on this original paper is quite rare! 500 pieces of the 2p come with "SPECIMEN” overprints, which were hand-stamped by a metal device, not machine-printed. The 500 pieces of "SPECIMEN” overprints for the 8p come on Paper C, because by the time APO was ready to print the "SPECIMEN” stamps, the newer printing on Paper C were the only ones lying around, and APO was not aware nor concerned about the different paper types. They just machine­-printed 500 pieces of the new printing. As mentioned in the notes under Series VII, the same two cacheted envelopes, in a quantity of about 650 were used to service this Series VIII. The redrawn 1p, 2p and 5p have the year date "2004" thinner and longer than on the original printing since there are spaces between each digit, instead of all four digits joined or close together. The "2004" now touches the left and bottom frame lines and the denominations touch the right and bottom frame lines. 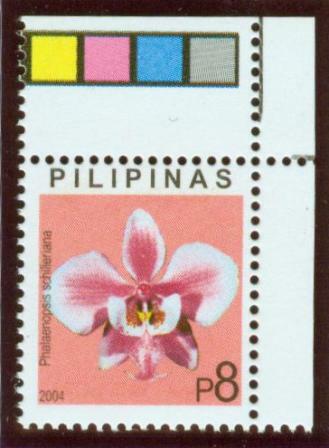 The names of the orchids also touch the left frame line. The new printing of the 8p is actually the same as the one in Series VIII, which is already in the style in which "2004" and denomination are touching their respective corners. But this new printing is on the new Paper C, with "invisible" matte (dry) gum. 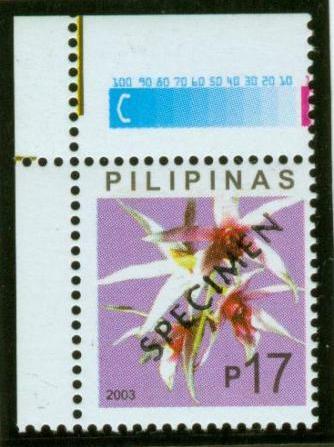 Type I - has the orchid's Latin name 7 1/2 mm. long. 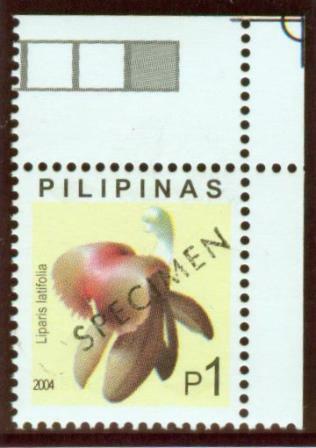 Type II - has the orchid's Latin name 8 1/2 mm. long. On this variety, the name starts closer to "2004", with a 4 1/2 mm. space between them instead of 5 mm. This type occurs 10 times in each sheet of 100: on position #s 10, 20, 30, 40, 50, 60, 70, 80, 90 and 100. 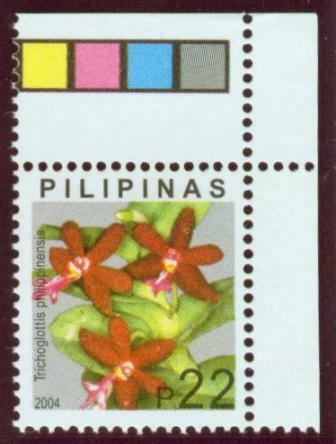 Type I - has the orchid's Latin name 14 mm. long. 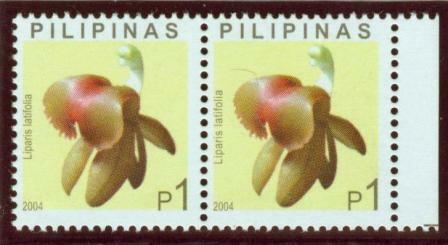 Type II - has the orchid's Latin name 13 1/2 mm long. On this variety, the name starts closer to "2004", with a space of only 1 1/2 mm. between them instead of 2 mm. This type occurs 13 times in each sheet of 100: on position #s 19, 20, 39, 40, 49, 50, 59, 60, 69, 70, 89, 90 and 100. 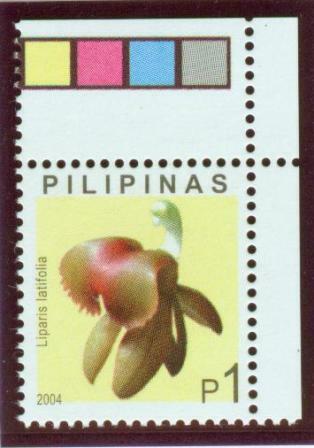 Type III - has the orchid's Latin name extra long at 16 1/4 mm. On this unusual and outstanding variety, the name starts very close to "2004" with the letters farther apart, so it ends very close to the top frame line. This occurs only once in every sheet of 100: on position # 65. The same three types are naturally found on both the Paper B and Paper C. Since stamps on Paper B were exhausted rather quickly, the Type III on Paper B has become very scarce to rare. 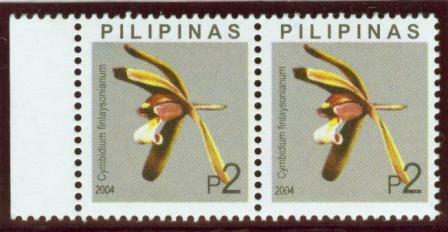 Type II - has the orchid's Latin name 12 mm. long. On this variety, the name starts closer to "2004", with a 3 mm. space between them instead of 3 1/2 mm. The letters are farther apart so it ends closer to the top frame line, with a space of only 3 1/2 mm. between them instead of 4 1/2 mm., the "c" of "Plicata" is on top of the midline of the petal on the upper left instead of below it This type occurs ten times in every sheet of 100: on position #s 1, 2, 3, 4, 5, 6, 7, 8, 9 and 10. Though the print run on this variety on the new paper with invisible, dry (matt) gum is quite high, with only two such varieties per sheet of 100 (on position #s 41 and 42), this newly discovered variety must still be quite scarce, since it has not been reported till now. The initial order was 500,000 for the 1p, 3,000,000 each for the 2p and 5p, and, 14,750,000 for the 8p. In July 2004, there was an additional order of 14,000,000 for the 2p and 18,500,000 for the 5p, which all came on the new Paper C.
In December 2004, there was an additional order of 1,000,000 for the 1p stamps. The excess quantities for each of the four values (six stamps) were estimated from the combined renegotiation package (160,000 for 1p, 750,000 for 2p, 680,000 for 5p and 780,000 for 8p) delivered on November 16, 2005. Two sheets of the 8p have been discovered with two extra rows of comb perforations that are misplaced and slanted over the top two rows of the sheet. No first day cover envelopes were printed for Series IX. 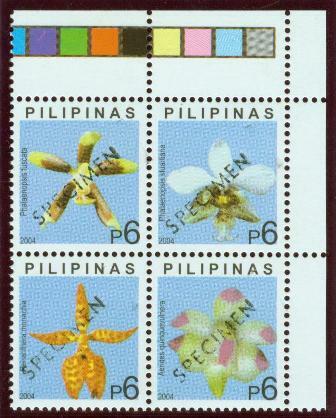 These redrawn/revised printings were considered only as additional printings and not as new stamps. Aside from the change of year dates to "2004", there are other differences on these four new varieties when compared with the 2003 printings. On the 10p and 17p, the orchids' names are thinner, and closer to the left frame line. On the 17p, the "P" sign ends at the same level as "17" instead of "floating". 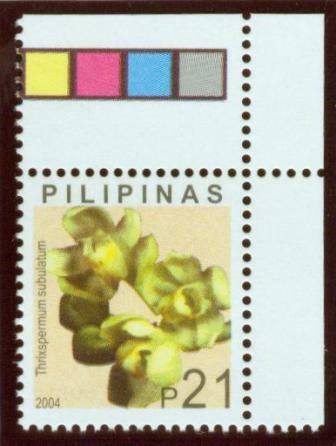 On the 21p and the 22p stamps, the orchids' names are longer, as the letters are not as close together, and they are closer to the left frame lines. The "P" signs also end at the same level as "21" and "22". 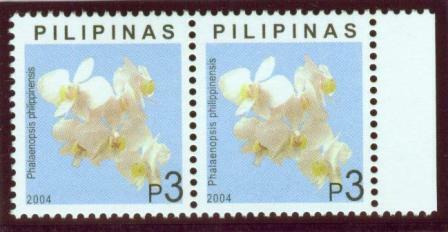 Type II - has the orchid's Latin name 10 1/3 mm. long. On this variety, the name starts closer to "2004" with a space of only 3 2/3 mm. between them, instead of 4 1/3 mm. The letters are farther apart, so they end closer to the top frame line, with a space of 4 2/3 mm. between them, instead of 5 1/3 mm. The name starts with the "p" of "Epigeneium" touching the lower left petal instead of the "E" touching it. This type occurs 20 times in every sheet of 100: on position #s 1, 2, 11, 12, 21, 22, 31, 32, 41, 42, 51, 52, 61, 62, 71, 72, 81, 82, 91 and 92. Type II - has the orchid's name 12 2/3 mm. long. On this variety, the name starts farther from "2004", with a space of 2 1/2mm. between them instead of just 1 1/2 mm. The letters are closer together, so the name ends farther from the top frame line, with a space of 3 1/2 mm. between them, instead of 2 2/3 mm only. 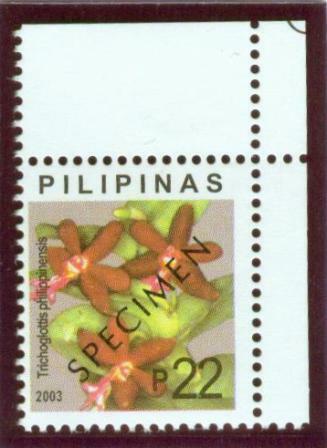 The "is" of "philippensis" touches the lower edge of the top leaf on the upper left, in­stead of being inside the leaf. This type occurs 35 times in every sheet of 100: on position #s 16-20, 26­30, 36-40, 46-50, 56-60, 66-70 and 76-80. The actual order was 6,000,000 for 10p, and 5,000,000 for each for the other three values. The excess for each were from renegotiations delivered on November 16, 2005. No additional first day cover envelopes were issued for Series X. As with Series IX, these were not considered as new stamps, but rather, just additional printings of cur­rent definitives. Type II - has the orchid's Latin name 15 1/2mm. long. On this variety, the name starts closer to "2004", with a space of only 1 mm. between them, instead of 2 mm. The letters are farther apart, so it ends closer to the top frame line, with a space of only 2 mm. between them, instead of 3 mm. This type occurs 10 times in every sheet of 100: on position #s 10, 20, 30, 40, 50, 60, 70, 80, 90 and 100. 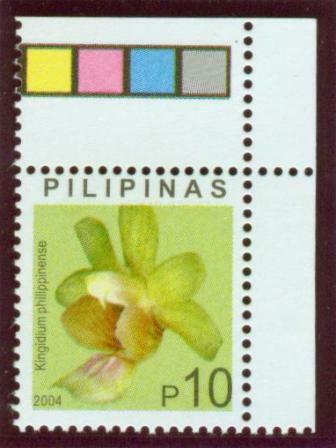 Type I - has the orchid's Latin name 11 - 11 1/4mm. long. 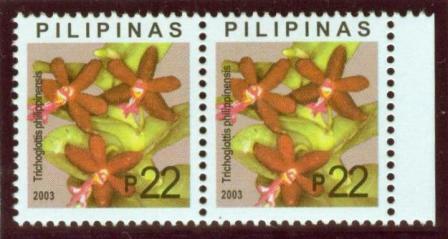 Type II - has the orchid's Latin name 12 1/2-12 3/4 mm. long. On this variety, the name starts closer to "2004", with a space of only 2 1/2 mm. between them instead of 3 1/3 mm. The letters are farther apart, so the name ends closer to the top frame line, with a space of only 3 1/2mm. between them, in­stead of 4 1/4 mm. The name starts with "P" overlapping the petal at the lower left, instead of above it. This type occurs 10 times in every sheet of 100: on position #s 10, 20, 30, 40, 50, 60, 70, 80, 90 and 100. The actual order was 1,000,000 for the 3p, 5,000,000 for the 9p and 4,000,000 for the 20p. The excess for each of the three were from renegotiations. There was no 4p included in the renegotiations. 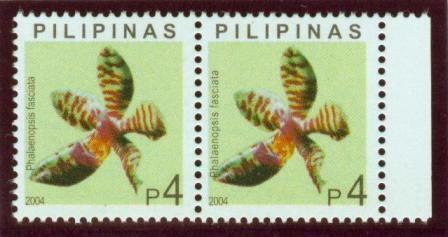 500 sets of these four stamps come with "SPECIMEN" overprints, which are all machine-printed. The same two cacheted first day cover envelopes used for Series VII and VIII were used to prepare first day covers for this series. About 700 covers were serviced. Se-tenant Blocks of 4 with machine printed and handstamped "SPECIMEN"
The actual order was 3,000,000 se-tenant blocks of four. The excess were from renegotiations delivered on November 16, 2005. 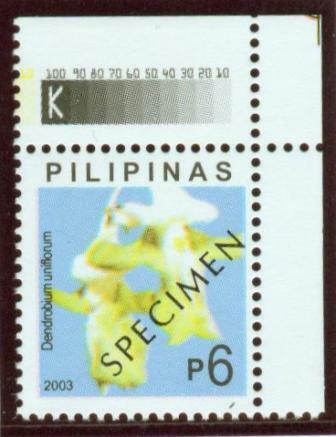 The first delivery of five sheets of specimen stamps has the "SPECIMEN" machine-printed. When the printer was reminded that there are four designs and therefore, there should be 20 sheets in all, they had already cut up all the printed press sheets, therefore, the remaining 15 sheets of 100 "SPECIMEN" stamps, deliv­ered much later, have "SPECIMEN" hand-stamped by a metal device instead. This oversight created four interesting varieties for "SPECIMEN" stamp collectors. 500 first day covers with a new cachet were printed for this final issue. It appears APO-NEDA is very careless, and their attitude can be considered as indifference, when it comes to the small texts on the stamps that they print. However, this laxity created a lot of collectible and interesting varieties for us. It remains to be seen whether more collectible varieties may one day be reported again.